High Quality Content by WIKIPEDIA articles! 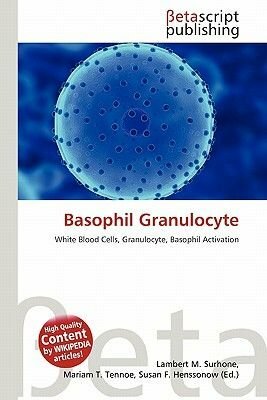 Basophil granulocytes, sometimes referred to as basophils, are the least common of the granulocytes, representing about 0.01% to 0.3% of circulating white blood cells. The name comes from the fact that these leukocytes are basophilic, i.e., they are susceptible to staining by basic dyes, as shown in the picture. Basophils contain large cytoplasmic granules which obscure the cell nucleus under the microscope. However, when unstained, the nucleus is visible and it usually has 2 lobes. The mast cell, a cell in tissues, has many similar characteristics. For example, both cell types store histamine, a chemical that is secreted by the cells when stimulated in certain ways (histamine causes some of the symptoms of an allergic reaction). Like all circulating granulocytes, basophils can be recruited out of the blood into a tissue when needed.